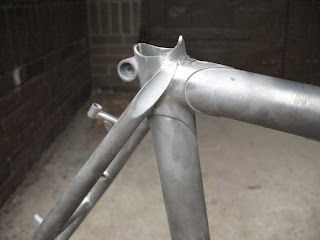 Here’s some more pictures of the recently completed frame and fork. 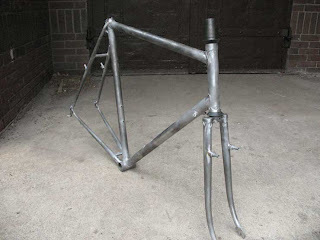 The frame is built around 700C wheels, 32mm tires with clearances and mounts for fenders and canti brakes. The lugs are the previously pictured Pacenti lugs that I carved up. I’m happy with how it all turned out. Here’s a nice shot of the completed seat lug. You can see how I carved down and reshaped the top of the seat lug. I think it looks more balanced and sedate. 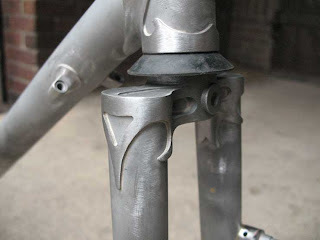 Also you can see the capped seat stay after it’s been brazed onto the seat lug. I don’t know why but the bottom head tube lug is my favorite. This, to my eye, is a great photo of it. Notice how the lug has been thinned. I can’t stand when lugs get stock on and left at stock thickness. I guess that’s fine for a production bike but for a handcrafted frame the lugs look so much better thinned out. 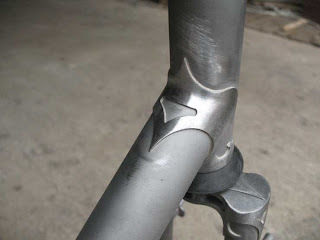 Here’s a nice shot of the fork crown. It too has been thinned and the points have been tapered. While not necessary it shows the hand of the maker.